SEARS: Where do you read your daily news [not just industry news, but all news]? Do you still read a newspaper? Listen to the radio? Use social media? BERTOZZI: Twitter is usually where I start the discovery. Where I end up reading the news varies. I also use the Guardian News app as an anchor. Occasionally I will grab a newspaper but safe to say most of my news consumption is online. SEARS: What’s your favorite commercial of all time? BERTOZZI: My favorite commercial of all-time is an ad for Blackcurrant Tango. SEARS: Today on average in the United States — out of each $1.00 spent on media (all media, not just digital) by one of your advertisers — how much is spent on automated or programmatic channels? BERTOZZI: We’re seeing $0.08 of every $1.00 spent on programmatic channels in 2014, and I think we’re still in the early stages of adoption — even in the U.S. — but it’s starting to rise. We’re going to see a sharp increase as education continues across agencies and clients. SEARS: What was this number in 2012? SEARS: What will this number be in 2016? SEARS: What is the mission statement of VivaKi AOD? 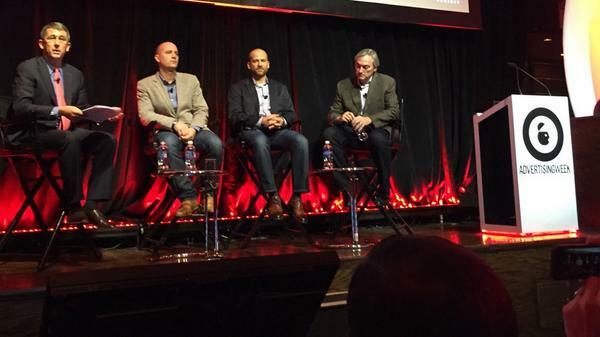 BERTOZZI: Audience On Demand® (AOD) was built exclusively for Publicis Groupe agencies and their clients. Created in 2008, our sole purpose has been to help our agency partners and their clients control their brands and messaging in a fragmented, digital ecosystem. We work as an extension of the agency team our clients trust to steward their advertising spend and marketing activity. SEARS: How many employees are there in your United States organization [headcount number]? SEARS: What are VivaKi AOD’s three biggest U.S. initiatives in 2014? Quality and viewability. We launched Quality Index — a proprietary evaluation process that vets all ad placements through AOD. Built on performance metrics and data provided by comScore, Integral Ad Science (IAS), Proximic and various DSPs, as well as ad server performance data, Quality Index also sources inventory according to various metrics that assess viewability, page content quality and historical performance. This year, we also invested in the building out of the VivaKi OS, combining the AOD Platform and DMP, supported by our established channel solutions (display, mobile, video and social) and our VivaKi Verified teams. We introduced AOD Brand into the US market. Focused on large-scale formats, it gives advertisers impactful creative in the right locations. It’s the best of RTB with premium inventory, utilizing private marketplaces and giving brand advertisers a vehicle to deliver programmatically against brand objectives. It’s an approach already heavily used in Europe but now formulated for the US. SEARS: By 2016, what percentage of your holding company’s U.S. media spend will be automated or programmatic? SEARS: Can linear TV be automated, yes or no? BERTOZZI: Yes! The real question, however, is whether large broadcasters are willing to invest in adapting to new and efficient ways of trading or do they prefer to hold on to “how it has always been done.” Media automation is an inevitability and those that move fastest will benefit the most. SEARS: Does VivaKi AOD plan to automate linear TV in 2014? 2015? BERTOZZI: No, but we intend to work with all available and accessible inventory and that includes connected TV inventory which will increase substantially over the coming months and years. The shift from TV to multiple screens will power the increase in inventory and as audiences across devices move away from just traditional TV the opportunities will only increase. SEARS: Once linear TV is automated, will it be bought by TV buyers or digital buyers? BERTOZZI: As we are already witnessing, there is a massive blurring of roles within agencies. By the time linear TV is automated I would suggest that roles and in fact most agencies including those in our group will be well under way with planning and buying being very much across screens and channels. BERTOZZI: Other. We see our role as threefold. First, we build technology that powers AOD in order to join up the complex programmatic ecosystem. Second, we evaluate and consult with advertisers on technology and data providers that best address their particular campaign needs and goals. Third, we provide marketing expertise and services for agencies and advertisers on campaigns including human oversight, strategic direction, context and advice that a machine simply cannot [offer]. BERTOZZI: A. We make sure that our clients know how much spend is going against working media. I strongly believe this should be an absolute given for any business that aligns its objectives with its clients’ objectives. We also do not arbitrage media, as we believe this is counter to the principles and efficiencies offered by programmatic media-buying and takes us further away from the spirit of collaboration and true partnership with our clients. SEARS: What percentage of your agency or advertiser’s site direct budget (direct orders) has been automated? BERTOZZI: A. All of our buys are auction-based and therefore we do not allocate budget for direct-buys. BERTOZZI: While all of the above are valid considerations, I believe the biggest factors that will help accelerate the automation of direct orders are actually tech development and greater alignment on inventory. As I’ve previously mentioned, there have been occasions where we wanted to push significant spend across premium publishers but the publishers were not ready to accept it. SEARS: Tell us a bit more about you. SEARS: Who was one of your first mentors as a child? BERTOZZI: My brother. Five years older than I, he was (and is) someone I looked up to and not just because he defended me when I got into scrapes. It was his sound advice that ultimately led me into media agency life — so I should thank him for that! SEARS: Money is not a concern. You no longer work in advertising or technology. What would you choose to do for work? BERTOZZI: Having always loved animals, I would choose to work on an African game reserve. The solitude and connection to nature attracts me as does working with the most incredible animals on the planet. I would however probably still look for a connection to data, no matter how slow!